Welcome to my "Strength and Comparison" article for the coming week. The article "Ranking, Rating and Score" has also been published. 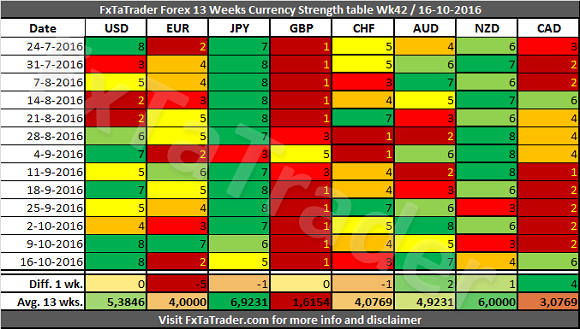 When looking at the Currency Strength in the table here below we can see that the USD is the strongest currency, the GBP is the weakest and the CAD recovered after loosing a lot of strength in the 5 weeks before. The USD, AUD and CAD clearly got stronger in the last week and the EUR weaker. For more details read both of my articles where the relevant Charts and Tables are provided. The TA Charts for each Time Frame could also be consulted. The USD(Strong) has an average score higher but close to the AUD(Average). It had however 7 times a higher score in the last 13 weeks so it is clearly still stronger but may become an Average currency. This was avoided last weeks because of the high score of 8 in these last 2 weeks. The EUR(Weak) has an average score lower but close to the CHF(Average). It had only 5 times a higher score in the last 13 weeks so it is clearly the weaker currency. The EUR however is more in the range of the Average currencies than the Weak currencies. Because of the low score of 2 last weeks it remains a Weak currency for now. This currency will be monitored closely in the coming week and may become an Average currency. 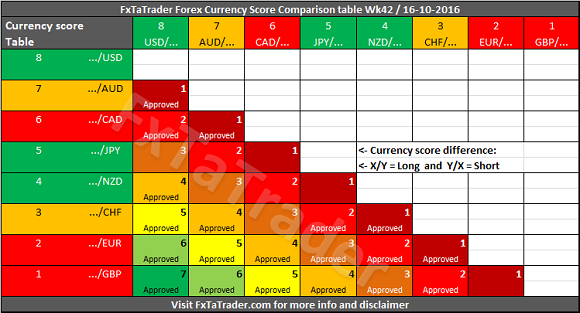 Here below you can see the Weekly Currency Score Chart of the strong currencies with 6 months data as a reference. 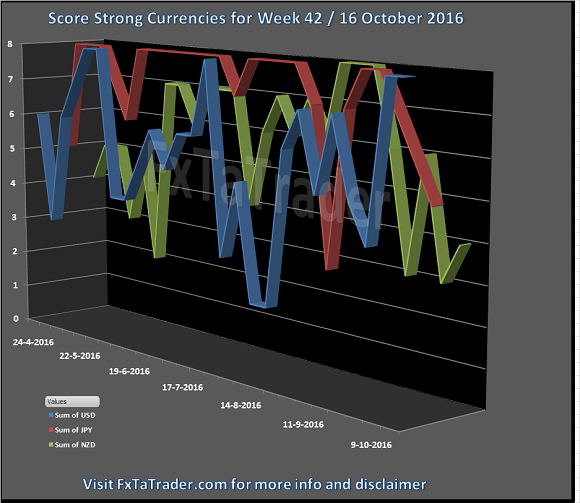 As can be seen the USD is gaining strength in the last weeks with the exception of the dip on October 2 (Week 39). The NZD is weakening but because of the high scores in the weeks before it has still a high average score. The JPY was very strong for a long period but is showing at the moment the second dip in a short period. These are strong or average currencies from a longer term perspective when looking at the last "13 Weeks currency classification". Unless these currencies offer a clear opportunity based on the longer term it seems best to be avoided. However, these currencies may offer opportunities for the short term trader. Some of the pairs in the "Currency Comparison Table" comply for a longer term trade based on the Technical Analysis (TA) of the Daily and Weekly chart. For the coming week these seem to be: GBP/USD, GBP/AUD, GBP/CAD, GBP/JPY, EUR/USD, GBP/CHF, GBP/NZD, USD/CHF, EUR/CAD, EUR/JPY.